The 2019 RM-Z450 remains the champion’s choice, as its sleek, race-ready appearance, strong engine, and nimble chassis continue the Suzuki tradition of extraordinarily precise handling. 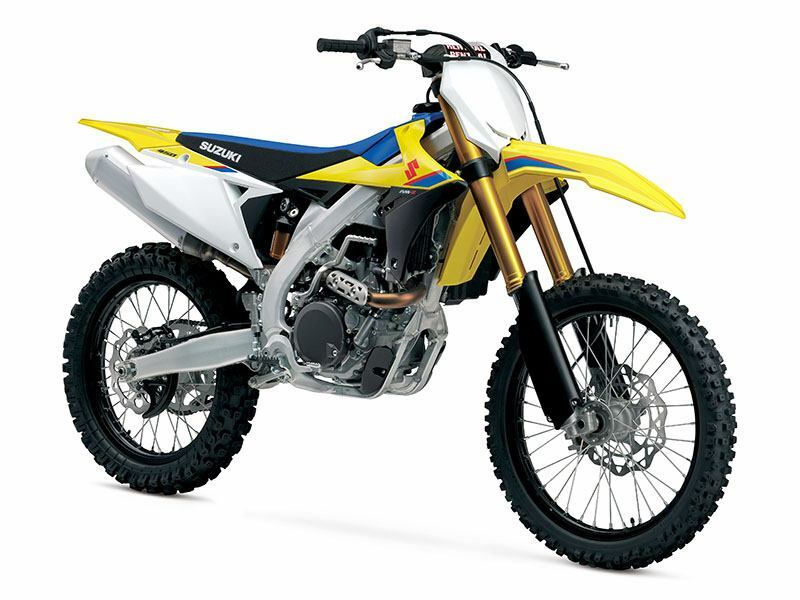 The RM-Z450 epitomizes Suzuki’s Winning Balance philosophy with strong brakes for controlled stopping power, a wide spread of engine muscle with high peak power, and a strong, light, and more nimble chassis that remains the class standard for cornering performance. The 2019 RM-Z450 features an evolved and efficient traction management system. The Electronic Control Module (ECM) continually measures throttle opening, engine speed, and gear position and then adjusts the ignition timing and fuel injector duration to fine-tune the engine output to deliver the best traction for the riding conditions. The RM-Z450’s traction management system is different from a street bike traction control system, as it does not measure rear tire spin. Because the needs of a motocrosser are different than a street bike, this system offers constant adjustment that maximizes traction at all times. The Suzuki Holeshot Assist Control (S-HAC) is a selectable launch system derived from the factory race bike to help riders’ takeoff from the starting gate for an early lead. There are three launch modes riders can choose for the best option per their skill level and starting conditions. There are also three stages to Mode A and Mode B of the S-HAC system. This helps riders at the moment of launch, when crossing the gate, and through acceleration to the full speed. The S-HAC settings for Mode A on the RM-Z450 are specially tuned to aid the rider’s throttle control during launches. Mode A: For hard surfaces or slippery conditions at the starting gate. In this mode, S-HAC alters ignition timing at the moment of launch and the ride over the gate to reduce wheel slip to deliver a smooth takeoff. It also advances ignition timing during this sequence for stronger acceleration. After six seconds or when you reach fourth gear, the system shuts off and returns to normal ignition timing. Benefit of Mode A: For novice riders, and/or hard and slippery traction conditions, use Mode A for a more controlled launch. Mode B: When conditions at the starting gate have better traction, and a more aggressive launch is desired. S-HAC will advance the ignition timing to allow increased throttle response and stronger acceleration off the line. The ignition timing alternation is in a similar sequence as Mode A, but with increased overall timing. The system will return the ignition to normal operation in three situations (whichever happens first): After six seconds, when you reach fourth gear, or when the throttle is closed. The system then shuts off and returns to normal ignition timing. Benefit of Mode B: For skilled riders, and/or good starting conditions, use Mode B for a more aggressive launch. Designed for motocross use, the lightweight, battery-less, electronic fuel injection system is key to the engine’s efficient power delivery. Easy-to-use fuel couplers are included to simplify EFI tuning. For quick fuel adjustments to suit riding conditions, two couplers are provided. By plugging in either of two additional fuel-setting couplers to the wire harness, riders can opt for a richer-than-stock or leaner-than-stock fuel setting. 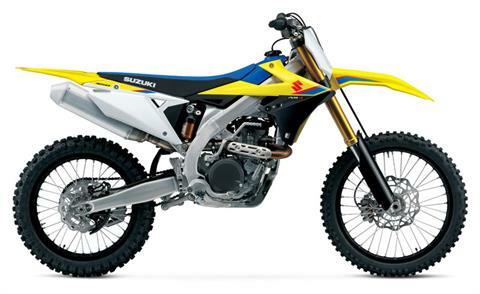 The RM-Z450’s twin-spar frame and twin-beam swingarm design continues Suzuki’s tradition of delivering the best-handling motocross machines available. This aluminum alloy, twin-spar frame combines cast and extruded sections to achieve superior front-and-rear weight distribution while balancing strength and weight. The frame is 700 g (1.32 pounds) lighter than the prior generation RM-Z450 to improve cornering performance and shock absorption while delivering stable handling. The swingarm is assembled with thin, yet strong, materials for improved cornering performance and stable handling. The short wheelbase and frame head pipe location produces quick and nimble handling characteristics. Hexagonal aluminum rails are used on the sub-frame for light weight, a slimmer appearance, and easier air filter service. The sub-frame rails route inward to slim the bodywork, but also route upwards to provide additional space for the large air cleaner and the advanced BFRC shock absorber. Like the trim sub-frame, all of the bodywork is slim to enable the RM-Z450 rider to move freely in the cockpit, especially during spirited riding. Inspired by the advanced suspension from the GSX-R1000R Superbike, the RM-Z450 is fitted with a Showa BFRC shock absorber. The BFRC uses a separate, external damping circuit that improves the responsiveness of damping force to deliver excellent traction and better absorption over bumps. The fully adjustable BFRC controls damping so well during minute suspension movements that ride comfort is increased at lower speeds, while stability is enhanced at higher speeds. The 2019 RM-Z450’s BFRC shock has a spring rate and corresponding damping force settings to produce even better handling characteristics. The generation Showa coil spring front fork has large inner tubes and rod pipes for strength and durability. Springs in each fork leg combine with large, adjustable damping cylinders to deliver better response to the terrain and provide a strong feeling of control to the rider. Front suspension tuning and maintenance is balanced and easy: a great benefit during frequent riding. Compression damping force settings for the fork also contribute to improved handling on the 2019 RM-Z450. The strong Renthal aluminum tapered handlebar has a straighter bend than prior models to help aid the rider during aggressive maneuvering. The light upper fork bracket was developed to complement the Showa coil spring front suspension and handlebars. For effective stopping performance and feel, a large 270 mm, wave-style front brake rotor with twin piston caliper are used. The trim rear brake master cylinder hugs the frame beam to reduce dirt contamination and the chance of the rider’s boot touching it during riding. To support the strong engine, braking, and handling performance of the RM-Z450, the bike is fitted with racetrack-developed Bridgestone Battlecross X30 tires. The wheels feature black anodized rims with a cross-section design that maintains strength while reducing un-sprung weight. Suzuki beak-inspired styling has a sharper front fender and radiator shrouds blending into side covers and an upswept tail, to promote the impression of speed while reducing weight and easing service. The functional styling and the motorcycle’s trim chassis permit a variety of rider positions that facilitate control and comfort. The plastic fuel tank weighs a half-pound less than the prior generation’s aluminum tank. Fuel capacity is an ample 1.7 gallons. The seat base, inner fenders, and side covers were developed to reduce the amount of moisture and dirt that gets to the air cleaner. This helps prevent debris from contaminating the air filter element. Made with a special density foam, the seat is well shaped and slim to aid the rider’s control of the motorcycle. The seat has a large blue gripper panel that runs nose-to-tail on the cover. The Championship Yellow bodywork is enhanced with 2019 graphics package that features distinctive striping and Suzuki logos. The 449 cc, liquid-cooled, four-stroke, four-valve, DOHC engine is the latest incarnation of Suzuki’s proven and reliable fuel-injected powerplant. The engine has high peak horsepower with strong torque at lower engine speeds for excellent throttle response through the entire rev range. The cylinder head intake port shape creates a high amount of tumble flow to the incoming fuel/air to increase power output. The air cleaner’s large and straight opening creates a more direct air path to the throttle body to increase performance. Suzuki’s advanced fuel-injection system creates extra-smooth power delivery, high fuel efficiency, and superb reliability. The RM-Z450’s throttle body design locates the fuel injector, fed by a high-pressure fuel pump, so it sprays fuel directly at the butterfly valve to improve atomization of the fuel/air charge. This throttle body design eliminates complex control linkage, so the rider feels a more direct connection to the engine. The intake camshaft profile has more valve lift than the prior generation RM-Z450, increasing power at all engine speeds. The piston’s casting includes strengthening ribs near the wrist pin bosses to match component reliability to the engine’s high horsepower. Engine starting is simple and efficient due to a long kickstarter lever, well-matched internal gear ratios, a large air cleaner and breather system, plus an automatic decompression system that works precisely and efficiently (eliminating the need for a heavy and costly electric start system). The high-flow exhaust system complies with AMA sound regulations. Tough resin engine protectors help guard the coolant pump (on the right) and the stator cover (on the left) from debris and stones. 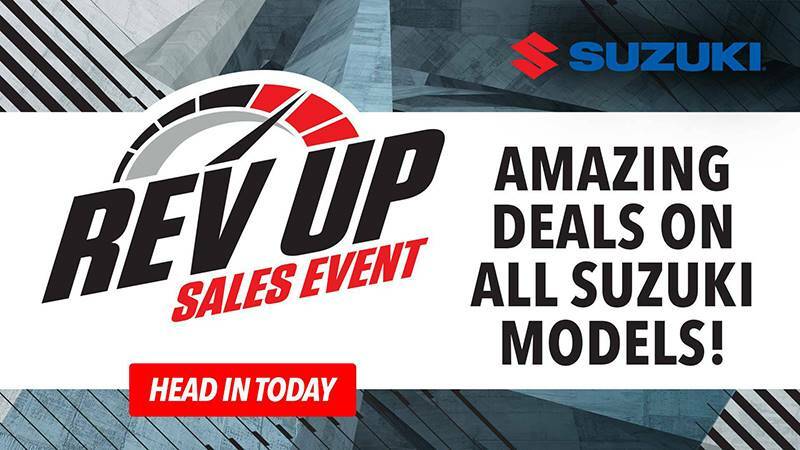 Great throttle response delivers high peak power, Evolved traction management system helps the bike hook up, Suzuki Holeshot Assist Control (S-HAC) gets you out front. Frame and swingarm balance lightness with strength, Chassis dimensions blend nimble handling with stability, Coil spring fork provides great performance and easy tuning, Showa BFRC (Balance Free Rear Cushion) shock with spring rate and settings delivers remarkable damping response, Bridgestone X30 tires bring outstanding grip. Large 270 mm front brake rotor increases stopping power and feel, Compact rear master cylinder is designed to prevent mud from collecting on it and from catching on the rider’s boots. Aggressive styling blends function with Suzuki character, Narrow cockpit lets rider move with ease for maximum racing performance. The well-sorted, five-speed transmission enables precise gear shift operation. This precise transmission feel is the result of an accurately machined shift cam for exact gear selection. Specialized machining processes also increase the precision of the matching gears. The multi-plate, wet-clutch uses rack-and-pinion clutch release mechanism for precise feel of the engagement and disengagement points while riding. The lightweight chain guide is shaped to accurately route the drive chain smoothly.